Today, my older son was on his best behavior on the way to the bus stop. This was very helpful as this was not going to be an ordinary morning. One of the kids on the bus stop, (I do not mention names) promptly climbed one of the ubiquitous snow hills and whipped out a pair of nunchaku or numchucks as they're known. As he did his best interpretation of Daniel Son and climbed down, two parents, a woman and myself, warned him that weapons were not allowed on the bus, much less school. The student (elementary, my dear Watson) ignored us and promptly boarded the bus with nunchaku hanging on his neck right under the nose of the oblivious bus driver. Several calls were made, one to Neff Elementary and the bus garage (another concerned parent beat to it). I also made the walk to Neff to make sure this kid's ignorance had not injured anyone else, much less my son. 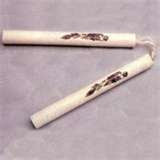 To be honest, these were practice nunchaku, covered in foam to prevent self-inflicted injury. Nevertheless, these can hurt someone. Boxing gloves are soft, but people can and do sustain serious injury from a fist inside of one these. Nunchaku on the eye will produce painful and lasting damage. My concern and those of the other parent were genuine. Honestly, If I had a car to take my son to Holbrook, he would have not gotten on the bus. Considering the circumstances, and a five minute drive from our stop to Neff, the danger was minimal. The kid was just ignorant, not violent. It was still worth the walk. To be honest, I've carried a pocketknife of some sort since I was this kid's age and this was never a big deal. It was better suited to my work than working someone over. Despite the fights I was involved with, brandishing or using it was not an option. There are more than enough anecdotes of old where kids actually used to take their guns to school during hunting season. There was also a greater sense of responsibility too. Guns and knives were tools with known inherent dangers from their misuse. At present, I would never advocate a child taking a gun, knife or any weapon to school for any reason. This includes that pair of nunchaku. Children are not as responsible and not as aware of the negative consequences as they might have been in yesteryear. This can be taken so many ways, but this my take on it.